Jacques de Gheyn II was one of the founders of the tradition of flower painting in the Netherlands. This exceptionally large panel is probably “the large vase of flowers surmounted by lilies” owned by De Gheyn’s son. It was likely kept in the artist’s studio as a showpiece to demonstrate his skills in a relatively novel artistic genre. When it was acquired by the Kimbell, it had been in a private collection since 1924, and its vibrant detail was obscured under a yellowed varnish. Following its cleaning and the removal of overpaint by the Museum’s conservation department, the painting’s glazes, fine details, and original sense of depth are again apparent. A brilliant draftsman and printmaker, De Gheyn was admired for his invention and range of subjects. His paintings are rare, and only twenty-some survive. He began to paint flowers when working in Leiden in the 1590s, no doubt encouraged by his friend the French botanist Carolus Clusius, director of the Leiden University botanical gardens. 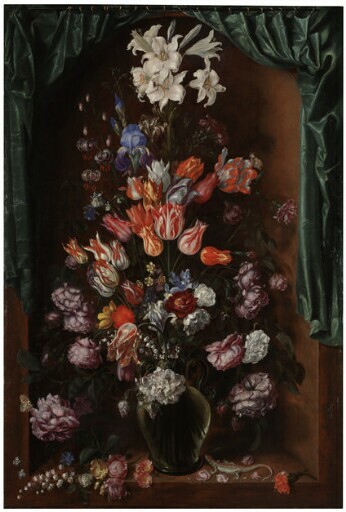 His reputation as one of the foremost flower painters of his time was confirmed when the Dutch parliament gave one of his flower paintings to the French queen, Marie de’ Medici. The Kimbell painting is a lively and virtuoso performance. The flowers—including precious varieties of tulips—are painted with scientific exactitude, making use of preexisting studies or templates. Enhancing the sense of depth is the painted curtain—an illusionistic trick, since at this date paintings were sometimes protected behind actual curtains. To create a dramatic composition that showcases the various species, De Gheyn manipulated certain elements of reality in his towering arrangement. For him and his contemporaries, the ephemeral beauty of the blooms may have suggested the transience of life. Above all, however, his painting celebrates the wonders of nature. probably bequeathed to his nephew, Johan Wttenbogaert [1608-1680], 1641. Possibly (anonymous sale, 27 April 1774, Amsterdam, no. 70). possibly (his sale, 1138 place de Meir, Antwerp, 1 September 1817 and following days, no. 174, as “on linen pasted on wood”), purchased or bought in by Martinez for 4.10 francs. (Sale, Brussels, 10 November 1923, no. 3). With (Jacques Goudstikker, Amsterdam), 1924.
purchased by Kimbell Art Foundation, 2008.